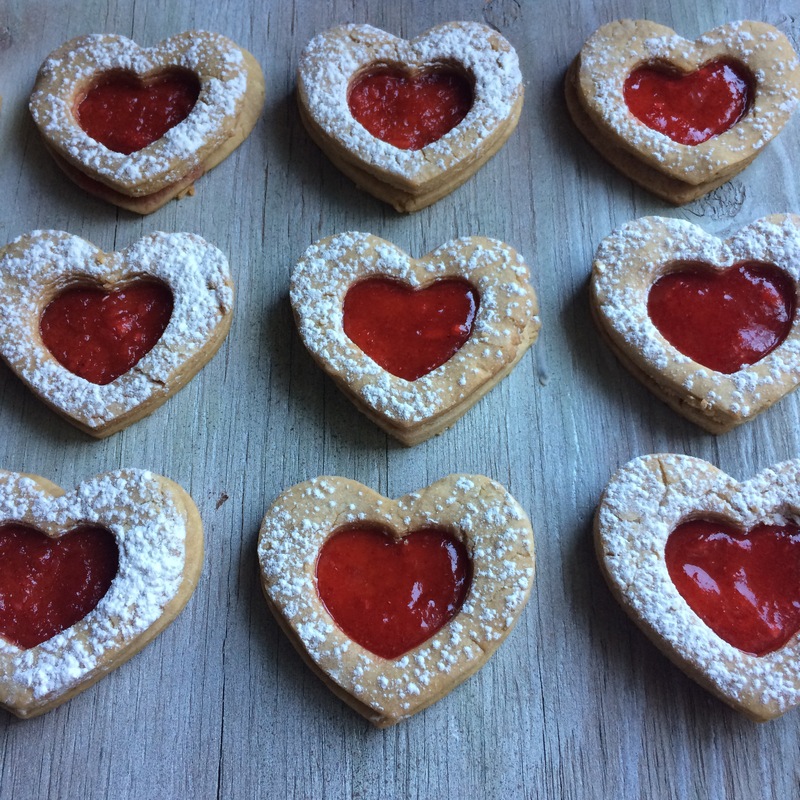 I originally saw these cookies in a Christmas issue of Southern Living but instantly wanted to make them with heart cutouts for Valentine’s Day. Our homemade strawberry jam is the perfect shade of red for a Vday Heart. And of course, nothing says “I Love You” like PB&J (unless you are allergic to peanut butter. Then don’t make these). I had never had a Linzer cookie before either, but couldn’t imagine these without the nutty peanut butter base. I was also thrilled these cookies tasted better the next day, when the jam got to soak into the cookie a little bit. What’s not to love? Preheat oven to 375°F with oven racks in the top third and bottom third of oven. Beat butter, sugar, brown sugar, and peanut butter with an electric mixer on medium speed until smooth, about 1 minute. Add egg yolk and vanilla, and beat on low speed just until incorporated. Whisk together flour, salt, and baking powder, and gradually add to butter mixture, beating on low speed until incorporated. Place dough on a well-floured surface, and roll to 1/4-inch thickness. Cut dough with a 2-inch heart shaped cookie cutter. Gently re-roll scraps once, and repeat process with cutter. Place half of the dough rounds on parchment paper-lined baking sheets. Using a 1-inch heart-shaped cutter, cut out and remove dough heart shapes from the center of the remaining half of dough rounds. (Reserve and bake dough heart cutouts for later, if desired.) Transfer dough rounds with heart cutouts removed to lined baking sheets. Bake cookies in preheated oven until cookies are set and beginning to brown, 12 to 13 minutes, switching pans top rack to bottom rack halfway through baking. Transfer pans to wire racks, and cool cookies completely, about 30 minutes. Sift powdered sugar over cookies with heart cutouts. Spread 1 1/2 teaspoons jam on 1 side of remaining cookies. 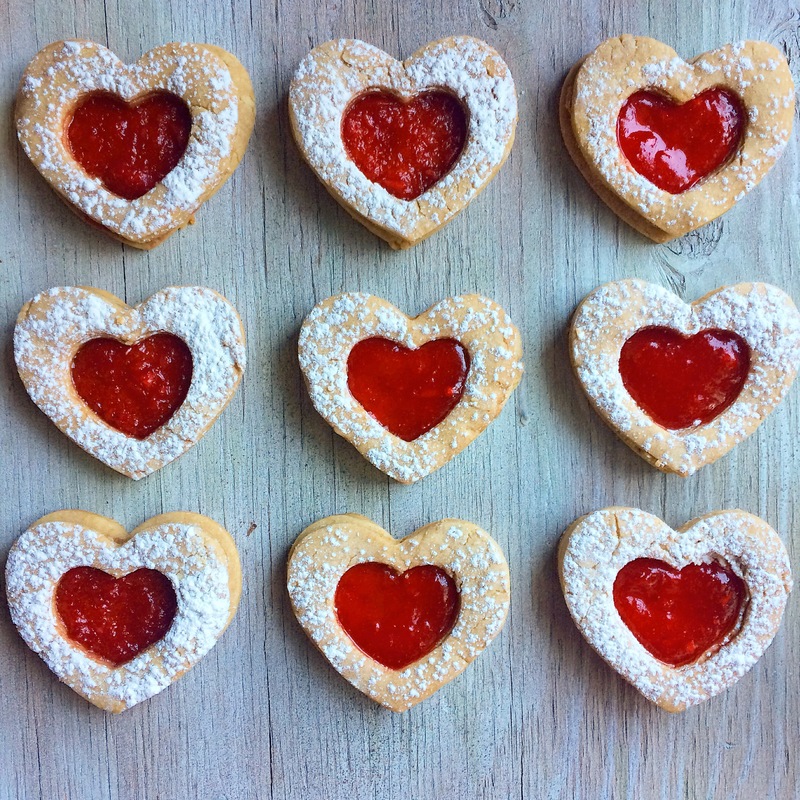 Place a heart cutout cookie, powdered sugar side up, over each jam covered cookie, and gently press.